We offer a variety of sedation options to make your children's dental experience as comfortable as possible. 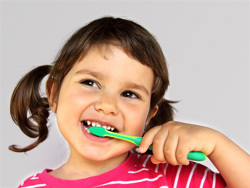 Sedation is the use of medications to help your child's behavior as he or she undergoes needed dental procedures. It will help increase his/her ability to cope with the procedure and decrease anxiety and discomfort The different sedation options are provide by Tender Care Pediatric Dentistry are listed below and Dr De La Roche will help guide you as to what would be the best option for your child. The American Academy of Pediatric Dentistry recognizes this technique as a very safe,effective to treat children's dental needs. Nitrous oxide/oxygen, or what you may know as laughing gas, is given to your child to relax him/her for their dental treatment. Nitrous oxide/oxygen is a blend of two gases which is given by a small breathing mask place over your child's nose, allowing them to relax, without putting them to sleep. They can select from different flavors like bubble gum, strawberry,grape,orange. The advantage of this procedure is that once treatment is completed your child remains fully conscious and keeps all the natural reflexes, it is not addictive and quickly eliminated from the body with normal breathing. It is important to remember that this is one tool in helping your child and is most effective in children that exhibit a mild degree of anxiety and moderate dental needs. Please inform us of any change in your child's health and/or medical condition. Let us know if your child is currently taking any medication or changes in his/her regular ones. IV Sedation is recommended for very apprehensive or special needs children with dental treatment needs. Dr. De La Roche will perform dental treatment in the office under IV sedation, which is administrated and monitored by a certified anesthesiologist.